The great VR headset revolution is well and truly underway, but just because you own an iPhone doesn't mean you can't get in on the virtual reality action. An Apple VR headset doesn't exist (yet), but there is a breed of super-cheap headsets that are compatible with everything from the creaky old iPhone 5s to the more recent iPhone XS and iPhone XR. While mobile VR headsets obviously have nothing on the best VR headsets,Cardboard-style equivalents have the chance to encourage large numbers of potential users to get on board with virtual reality. With regard to apps, you can access Cardboard joints, YouTube 360 VR videos, Facebook's 360 videos and more. So what better place to start than with one of these iPhone-friendly headsets? A low entry cost of virtual reality doesn't come much cheaper than an iPhone-compatible Cardboard kit. You can get an unofficial Cardboard headset for under £5 on Amazon, and with some of them you can get a strap and NFC so it powers up the app on command. There's also the official Cardboard from Google, which is compact and foldable. It's not as fiddly to make as the unofficial ones, but it's still going to fall apart if you don't look after it because, well, it's cardboard. Still, there's no easier or more affordable way to jump into VR. While most of these headsets are made out of hard plastic, the Merge VR Goggles opt for a soft, squishy foam. It helps make the headset light and comfortable. 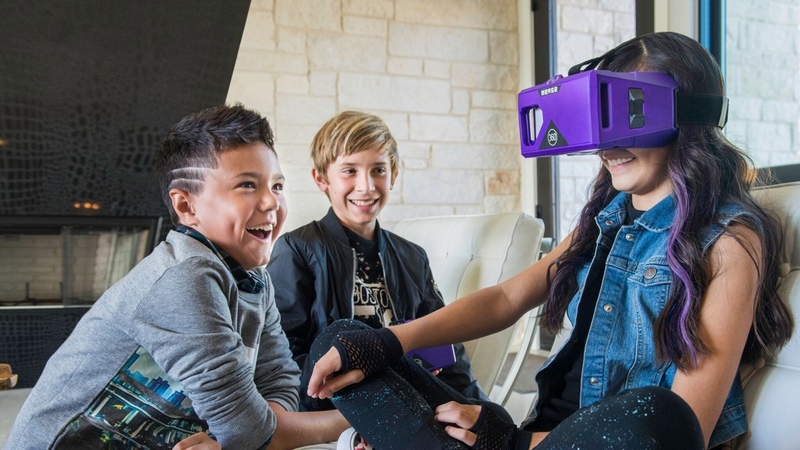 Plus, it's got a customizable strap that fits anyone from the age of 10 and above, adjustable lenses and two buttons to interact with your VR content. We found the lenses on the Merge to be surprisingly clear, and the device itself all iPhone models. However, the larger Plus and XS Max models can be a little snug getting in and out. The VR Goggles aren't just for virtual reality, either, they can be partnered with Merge Cube to have some neat augmented reality fun. All you have to do is pop out the little window in the front and do everything as normal, but with Merge's AR app and Cube in your hand. Most mobile VR headsets are simply a plastic case and a couple of lenses – hence the logic behind the super cheap Cardboard style devices. So Carl Zeiss' experience in making lenses puts it high on our list. The VR One Plus, which will fit all iPhones, lets you experience apps and video with a 100-degree field of view, and those picking up the Magnet Controller accessory can also control the action when strapped in. A little more expensive, sure, but a great option for those looking for something on the more premium end of the iPhone-compatible scale. The latest version of BlitzWolf's VR headset marries comfort and function. It's about what you expect from a VR headset for iPhone, fitting both regular and Plus variants. You can adjust pupil distance in case your eyes are close together or far apart. But that's not all. BlitzWolf's headset also understand that sometimes your eyes aren't the same, so it includes individual pupil distance, too. That means you can adjust how far or close the lens is to your individual eyes and cater for up to 300 degrees of nearsightedness. That, coupled with soft leather padding and upgraded lenses, makes the BlitzWolf a worthy choice. Heads up, though: This one is no longer available in the UK. Mattel's second View-Master mobile VR headset was the first to actually be sold in Apple stores but has since disappeared. You can still pick it up from other places, although it's getting more difficult to do so in the UK. The DLX VR has a redesigned smartphone mount to work with more sizes of iPhone, as well as Android, headphone support and upgraded lenses from the first attempt. The best bit? There are now a couple designs, like the iconic View-Master design with a modern twist and Ninja Turtle and Batman skins with bundled-in experiences. Can empathy-enhancing VR really make us care? Upping the tech stakes, the second generation Homido VR headset still offers a 100-degree field of view, compatibility with the newest iPhones all the way back to the 5S, all wrapped up in a slimmer design. It's also suitable for glasses-wearers, with space for specs inside the faux leather, interchangeable seal. If headsets aren't really your thing, Homido also makes a pair of VR glasses, although the effect will be far less pronounced than an HMD. Then there's the portable Homido Grab, which works with Cardboard and has a 100-degree field of view. It's also got a series of new accessories (not included), including a 360-degree camera and Bluetooth controllers to cater for your immersive shooting and gaming needs. If you need a headset for your iPhone but don't want the hassle of finding a pair of headphones each time you use it, BoboVR has your back with built-in speakers pumping out 720-degree 3D audio. If you want to take advantage of one of the cheaper options on this list and its impressive 120-degree field of view, though, you'll need to make sure your iPhone is between four and six inches. And since the speakers will only sync up with traditional headphone ports and not Lightning, those with phones living that #nojack life will have to bring their dongle along. If your device does fit the bill, you'll also be able to make use of the focus controls and adjustable strap to help tailor the headset for your trip to the virtual realm. Just be careful when picking out the right one, as there is a Daydream version of the Z5 that is not compatible with iPhone. Previously Android-only, this Freefly headset, the Beyond, adds iPhone capability up until iPhone XS. You'll get a 120-degree field of view and Crossfire capacitive touch triggers for your games. This headset has been out for a while now, but it's dropped in price considerably and will tide you over while we wait to see if Freefly's FF3 headset will ever launch. The FF3 is a hybrid headset that'll let you take part in virtual, augmented and mixed reality experiences. You'll just need to take off the headset's sides, which will also increase the field of view to 180 degrees. Since it was announced in 2017 though, its Crowdcube page has since disappeared and there hasn't been any updates on whether the product will come to market anytime soon. Plus, Chrome had flagged Freefly's site as unsafe. The site has since been switched to an Australian domain, so things are definitely changing. In the meantime, you can still get the Beyond headset from Amazon US for an affordable amount. Does anyone know if this will work with one eye? I bought a headset to use with a drone. the problem is that I am mostly blind in one eye and the headset splits the output of then screen between the two eye. If you only use one, you only see one half of the screen. Not much good!